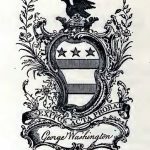 The bookplate of George Washington is probably the most interesting American bookplate. It is of the style known as Chippendale armorial as determined by the shape and ornamentation of the shield and of the tablet on which the name is engraved. 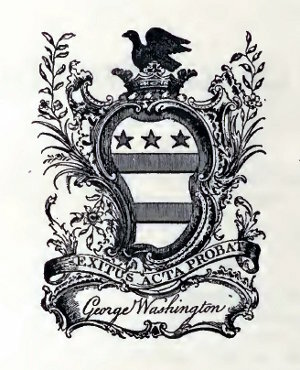 The shield and crest display the arms of the Washington family. The original is a copperplate engraving, by an unknown artist who is thought to have been an American because of the manner of engraving. 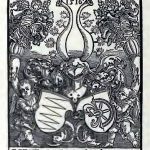 The Hilprand Brandenburg is one of three German bookplates known to date from the 15th century. It bears the arms of its owner and is to be found in several old board-bound manuscripts from the Suabian monastery, where Brandenburg was a monk. Like many old engravings, the originals are printed on scraps of paper and the arms are crudely colored. The bookplate's authenticity has been established by inscriptions in the old volumes in which it has been found. 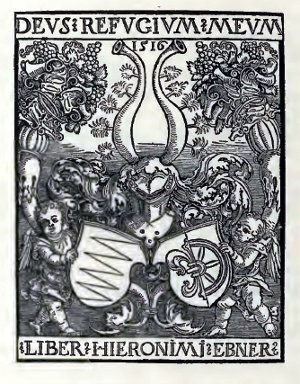 The earliest dated bookplate by Albrecht Dürer is the Hieronimi Ebner which bears the date 1516. 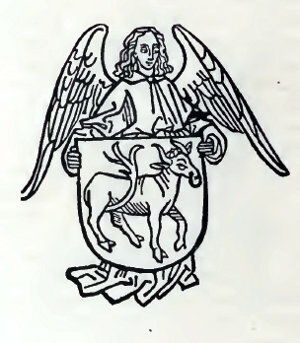 The inscription Liber Hieronimi Ebner leaves no doubt as to its actually being a bookplate, as is the case with a number of old wood-engravings thought to be bookplates but which have not been found actually in use as such. This is one of the earliest dated bookplates. From the first we find famous artists interesting themselves in designing bookplates. 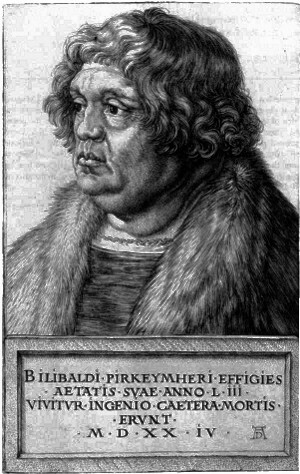 Albrecht Dürer made an armorial design for Willibald Pirckheimer, of Nuremburg, and Dürer 's portrait of that worthy has also been found in use as a bookplate, entitling it to the distinction of being the first portrait bookplate; a variety dear to the hearts of many enthusiasts who treasure seeing a book's owner peering out genially at a fellow booklover, or glaring at the biblioclast. 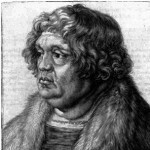 Other famous old artists who have made bookplates are Amman, Holbein, Cranach, Solis, Siebmacher, and Beham. 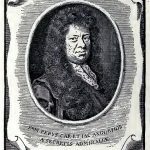 One of the most interesting examples of a portrait bookplate is that of Samuel Pepys, the famous Diarist. 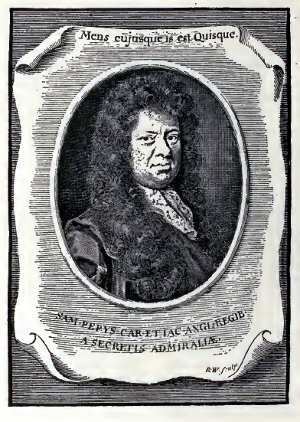 The plate, which was engraved by Robert White after one of the portraits by Sir Godfrey Kneller, seems to have been originally used as a frontispiece for Memoirs of the Navy which the owner privately printed in 1690. 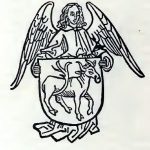 There is no doubt, however, about his having also used the design as a bookplate because it is still to be found doing duty as such in his books at Magdalene College. 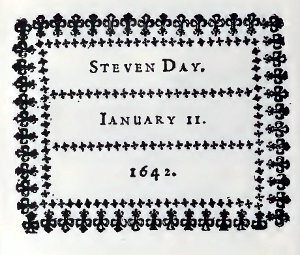 The typographical label of Steven Day, the Cambridge printer, is thought to be the earliest American bookplate. 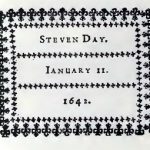 It was apparently printed by the owner, who was the first Colonial printer and the printer of the Bay Psalm Book. Only one copy of the label is known and is to be found in the collection of the American Antiquarian Society. 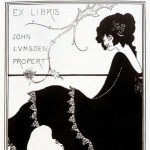 The John Lumsden Propert is one of only three bookplates drawn by Aubrey Beardsley. 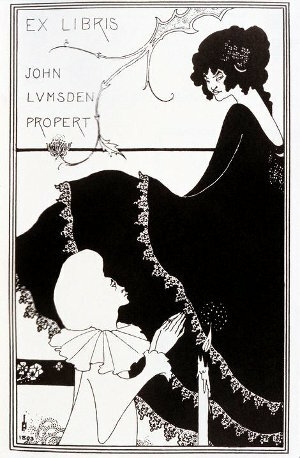 A number of his drawings have been adapted to the use of bookplates by having appropriate lettering added by other hands, but this design, the one for Olive Custance (Lady Alfred Douglas), and a drawing without lettering which the artist called his own bookplate, are the only drawings actually intended to be bookplates when they were drawn.